Pickup in Manila, drop-off in Angeles City / Clark /Batangas pier. Or vice versa. Maximum 8 persons with limited luggage or 7 persons with more baggage. Currency conversions are estimated and should be used for informational purposes only. Your payment will be in Philippine Pesos (PHP). Where do we pick you up? At what time do we pick you up? We are available 24/7. Choose any time you prefer. Where do we drop you off? How many passengers will travel? The driver will contact you on this phone number. 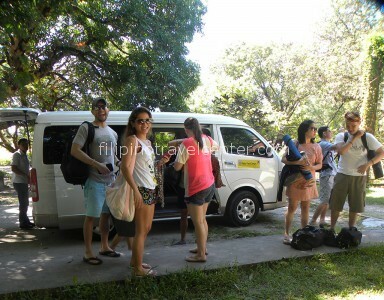 Our tour coordinator can be reached at (+63) (0)915 199 34 30 from 7AM – 8PM Philippine time. Ask a question about car rental? Enter the number of persons that will participate in the tour. Infants up to 2 years old are free. Do not include them in the number of persons that you enter. Let us know if you need infant car seats for your tour? On the checkout page you can add comments to your order. Please mention it if you need infant car seats. Metro-Manila is large, it is composed of a number of cities and towns. We include in all tours free pickup and drop-off at the most common tourist areas of Metro-Manila. These are Makati, Taguig, Ermita, Malate and Pasay. Because of the travel time and distance we charge 500 pesos per van per way in Metro-Manila outside these areas for pickup and drop-off. Unsure if this applies to you? On the checkout page you can add comments to your order. If you are unsure if this applies to you please add a comment to your order, and we will sort it out for you.